Emilia Wickstead - Clean lines and elegant silhouettes defines Emilia Wickstead's SS19 offering, including this pink cloqué Sheila midi dress. 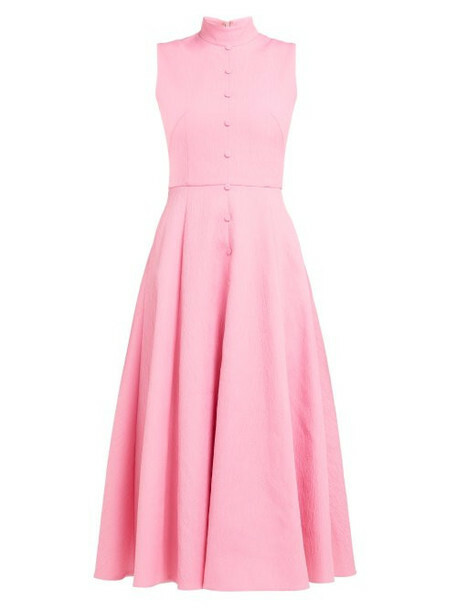 It's tailored in the UK for a slim fit with an elegant sleeveless bodice that's shaped with a high neck and waistline darts, then falls into a long, fluid skirt, lined with beige crepe and studded with coordinating pink buttons. Anchor it with gold stiletto heels and a ladylike box bag as part of a refined occasion ensemble.